It is when one takes into consideration the scenario of West Germany in the aftermath of the two World Wars – bruised, battered and in political isolation with a bad image to boot, that the arduous task of Asoka Weeraratna could be best appreciated. The message of the Dhamma taken to Germany by the German Dharmaduta Society that he founded, helped the Germans, recovering from the horrors of the war, to find inner peace. Sixty years later, at an alms giving to sixty monks held at the All Ceylon Buddhist Congress (ACBC) premises on September 23, 2012 to mark the founding of the German Dharmaduta Society (GDS), Ven. Waskaduwe Mahindawansa Nayake Thera said that Sri Lanka could not afford to give Germany, ravaged by the war, houses, cars or food. Instead we gave them a gift far more valuable - the teachings of the Dhamma which led them on a spiritual journey eschewing materialistic riches and one which teaches the elimination of human suffering by the conquest of the mind. The alms giving was preceded by a procession of monks from Athula Dassanarama Temple on Bauddhaloka Mawatha to the ACBC followed by the launching of a website dedicated to the GDS founder and a screening of a video documentary on the services rendered by him and the German Dharmaduta Society. It was during extensive travels of young Weeraratna in Europe whose business was importing Swiss wrist watches that he saw a flicker of hope rising from the ashes in West Germany – a spiritual hunger which he realized Sri Lanka could satisfy with the gift of the Dhamma. On his return to Sri Lanka, Weeraratna founded the Lanka Dhammaduta Society on September 21, 1952, which was later renamed the German Dharmaduta Society in 1957. The first Buddhist mission to Germany: At entrance to Das Buddhistische Haus in Berlin (1957) Seated front row: Ven. Kheminda; Ven. Soma; Ven. Vinita Standing from left: W.J. Oliver Soysa; J.T. Sirisena; Asoka Weeraratna (Founder and Hony. Secretary, German Dharmaduta Society), Knobloch; Henry Amarasuriya (Chairman, Board of Trustees, GDS); Mrs. Leena Amarasuriya, Ms. Wittiber, Mrs. Fischer, Miss Indrani Amarasuriya and a German lady. In Sri Lanka, with the end of the colonial rule, there emerged a great desire among Buddhists, to promote the Dhamma globally which had to be through the work of Dharmadutha monks and lay people. Ven. Mahindawansa Nayaka Thera pointed out that the tradition of ‘dharmadutha’ was not new to us. It was such a mission of Emperor Dharmasoka that brought Buddhism to Sri Lanka through Arhant Mahinda Thera. Therefore, Asoka Weeraratna’s efforts to take Buddhism to the West, was a continuation of this hallowed tradition. 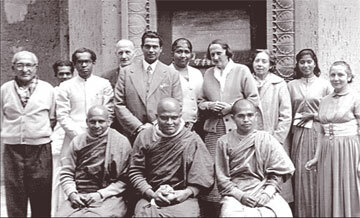 With the establishment of the new Society in 1952, Weeraratna was requested to survey and report to the Dharmaduta Society on the state of Buddhism as existed in Germany. And Weeraratna, focussed on taking the Buddha’s message to Germany, travelled throughout the country in 1953 when he met Germans who were already familiar with Buddhism, history and culture of Sri Lanka through the work of German scholars. Herman Oldenberg had translated the Dipavamsa in 1879 and the legendary linguist/historian Wilhelm Geiger’s translations of Dipavamsa, particularly the Mahavamsa had made a mark in Germany. However, with no Lankan Mission present in West Germany as diplomatic ties were yet to commence between the new Federal Republic of Germany and the then Ceylon which had newly gained independence, Weeraratna, virtually an Ambassador-at-large for Sri Lanka, got about on his own, on his mission. In the report following his surveys, his proposal of the need to send a Buddhist mission to Germany to coincide with the 1956 Buddha Jayanthi, headed the recommendations. For Weeraratna, Germany was the pulse of Europe and the German people were the most intelligent consisting of the largest number of Theravada Buddhists found in Europe. Therefore, Weeraratna was confident that the Sambuddha Sasana in Germany will take firm root. His plan included the building of a Buddhist Vihara, a Buddhist library, a Preaching Hall and translation of the Tripitaka to the German language. And to accomplish these goals ‘A Million Rupee Trust Fund’ was launched in 1954 at the Colombo Town Hall – an event attended by the then former Prime Minister Mr. Dudley Senanayake along with Cabinet Ministers, Diplomats, Buddhist Scholars and Prelates. The Trust Fund was declared as an approved charity by the Government and by 1956, the new Headquarters of the German Dharmaduta Society at 417, Bauddhaloka Mawatha, Colombo 7, had come up. The Opening was attended by the new Prime Minister S.W.R.D. Bandaranaike. The first West German Ambassador to Sri Lanka, Dr. Georg Ahrens was a prominent invitee at the ceremonial opening and was given due respect befitting a Diplomat of high rank although West Germans were yet persona non grata at the time. And the pioneer German Bhikku in Sri Lanka, Ven. Nyanatiloka Maha Thera, who had been a monk in Sri Lanka for 53 years, was made the first Patron of the GDS and he and his pupil Ven. Nyanaponika Thera offered to teach the German language to bhikkus to enable them to carry out dharmaduta work in Germany. 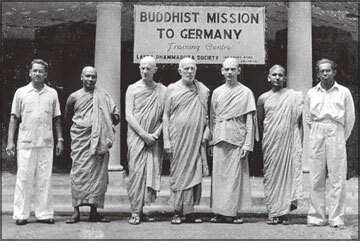 Weeraratna’s proposal to send to Germany a Buddhist Mission materialized with three learned bhikkus from the Vajiraramaya setting off from the historical Mihintale Rock, sailing to Germany and going into residence in July 1957 at the famed ‘Das Buddhistische Haus’ founded in 1924 by Dr. Paul Dahlke, the pioneer German Buddhist. Built on a six-acre plot with living quarters, library, meeting hall, rooms, cells for guests for quiet contemplation and for receiving instructions on Buddhist Teaching, the ‘Buddhist House’ was meant to be a place for inner purification. Dr. Dahlke and a group of thinkers had been living at the ‘Buddhist House’ following the Dhamma. A guest at the ‘Buddhist House’ had been Dr. Paul Dahlke’s close friend Anagarika Dharmapala when he had stopped over in Berlin in 1925, while he was on his way to London. The group had maintained a close link with the International Buddhist Union, headquartered in the Island Hermitage in Dodanduwa while the ‘Buddhist House’ had also served as the Publication hub of Buddhist news and literature to which Dr. Dahlke himself had been a contributor. 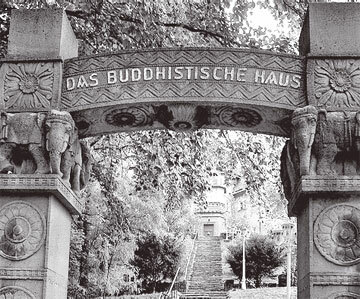 The acquisition of the ‘Buddhist House,’ converted to ‘Berlin Vihara’ which turned out to be a semi monastery with Bhikkus taking up residence, is considered as the most notable achievement of the GDS and to date remains the centre of Theravada Buddhism in Germany and continental Europe. Today, discourses on Buddhism, meditation and discussions are conducted by Bhikkus and lay teachers at the ‘Berlin Vihara.’ The Buddhist Library is well patronized and Das Buddhistische Haus has been declared a National Heritage Monument by the German government since 1995. With Weeraratna’s mission in Germany accomplished, he turned to re-building in Sri Lanka the most supportive and protective layer of Buddhism – meditation. Towards this end, he established the Mitirigala Nissarana Vanaya in 1967, a Forest Hermitage situated not far from Colombo and comprising 30 independent dwellings (Kutis) for Buddhist Yogi Monks who were guided by the outstanding meditation teacher, the late Venerable Matara Sri Nanarama Mahathera. An arduous task completed, Weeraratna resigned from the post of Honorary Secretary of the GDS, and entered the Bhikku Order in 1972, as Ven. Dhammanisanthi Thera. Living the life of a forest monk at the Mitirigala Nissarana Vanaya Aranya, for a period of 27 years, Ven. Dhammanisanthi passed away in 1999 at the age of 80. A life well-spent in the true spirit of the Buddha Dhamma, his funeral, reflecting the fundamental concepts of Buddhism, was conducted in a simple, austere manner in accordance with his wishes.